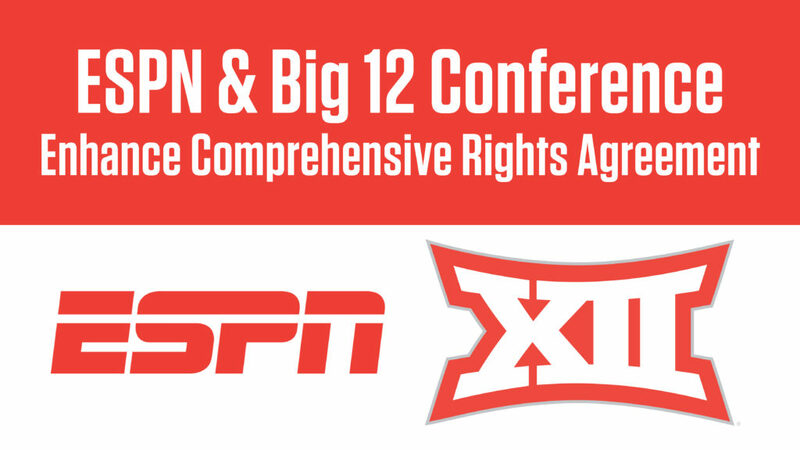 ESPN and the Big 12 Conference have significantly expanded their existing rights agreement, which runs through the 2024-25 season. Adding to its already robust coverage of the Big 12, the agreement means that ABC or ESPN will now exclusively televise the Big 12 Football Championship every year through 2024 – adding three additional championship games (2019, 2021 and 2023) and bolstering ABC and ESPN’s Championship Saturday lineup each year on the eve of College Football’s Selection Day. In addition, the agreement will bring hundreds of Big 12 events – including exclusive football and basketball games, as well as multiple other sports, conference championships and original content – to ESPN+, the direct-to-consumer subscription sports streaming service. As part of the agreement, all ESPN+ events will be produced and presented under a Big 12-branded offering to be developed by the conference and ESPN, and launched on ESPN+ ahead of the start of the 2019-20 athletic season. Eight of the conference’s 10 schools will produce and deliver multiple sports under the new Big 12-branded platform on ESPN+, with schools joining on a rolling basis. Starting in 2019, there will be games from Baylor, Kansas, Kansas State and Oklahoma State, in addition to the select Big 12 Conference championship events. In 2020-21, Iowa State, TCU, West Virginia and Texas Tech will join the lineup. Due to existing long-term rights agreements, Texas (the Longhorn Network) and Oklahoma will not produce and deliver programming included on ESPN+ at this time, but will be featured as road teams in games listed under the new Big 12-branded offering on the service. Big 12 events will be available as part of any ESPN+ subscription, and join a programming lineup of thousands of live sports events and thousands of hours of on-demand content, including acclaimed original programming and the 30 for 30 film library, as well as premium editorial content and tools. Fans can subscribe at www.espnplus.com. The ESPN App and ESPN.com will offer a branded, one-stop home for viewing Big 12 events, making events distributed under the new Big 12-branded offering on ESPN+ accessible to fans alongside current Big 12 events streamed from ESPN networks (available to pay television subscribers via “TV everywhere” authentication), as well as other related video. The content will also be served to fans who select Big 12 Conference member schools among their favorites in the ESPN App. Programming on ESPN+ includes hundreds of MLB and NHL games, exclusive UFC and Top Rank boxing events, top domestic and international soccer (Serie A, MLS, FA Cup, UEFA Nations League, EFL Championship, EFL Carabao Cup, Eredivisie, and more), thousands of college sports events (including football, basketball and other sports) from more than a dozen conferences, Grand Slam tennis – Wimbledon, U.S. Open and Australian Open, international and domestic rugby and cricket, new and exclusive series, acclaimed studio shows and the full library of ESPN’s award-winning 30 for 30 films. Fans subscribe to ESPN+ for just $4.99 a month (or $49.99 per year) and can cancel at any time. ESPN’s season-opening doubleheader on September 9:. Photos via ESPN ImagesProgramming Schedule ESPN. ESPN’s Sunday Night Baseball presented by. UFC Fight Night on ESPN+ heads.